Title page from A Biographical Dictionary of the Celebrated Women of Every Age and Country (1804). Matilda Betham was born in 1776 and raised in Suffolk, England. She learned portrait painting as a means to support herself and moved to London when her family faced financial troubles. Betham showed her art work at the Royal Academy and painted portraits of poets like George Dyer and Robert Southey. Additionally, she painted the portrait of Samuel Taylor Coleridge in 1802 who later became instrumental in the beginning stages of her writing career. He encouraged her to write and even composed the poem “To Matilda Betham, from a Stranger” for her. Considered a Romantic poet, Betham published poetry collections and in the early 1840s. She wrote an account of her life entitled Crow-quill Flights, which was circulated within a tight group of her acquaintances. Betham became interested in suffrage for women and at one time wrote a letter on behalf of women’s rights to John Cam Hobhouse, a member of Parliament. She published A Biographical Dictionary of the Celebrated Women of Every Age and Country in 1804 and it is now digitized and available in our Digital Library. Her introduction states she felt a book that covered the accomplishments of successful women throughout history was necessary, as it had never been done in English, and would be well received by readers. She began her proposal in 1801, but a similar work was being pursued and Betham waited until that book was completed before taking up her study again. 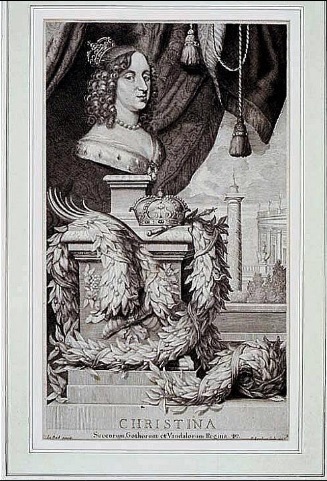 Portrait of Queen Christina VII of Sweden by Pierre Lombart, taken from the National Portrait Gallery. This extensive, almost 900-page book, documents women from all over the world who were important religiously, politically, or socially. Christina VII of Sweden was just one of the many women Betham discussed. A queen at only six years old, she spent her youth studying government and became a competent leader. However, her love of independence had kept her from marrying and she even went so far as resigning at the age of twenty-seven to fulfill her desire to be free. Unlike Christina of Sweden, Isabel of Spain did marry. Isabel I married Ferdinand and together they were supporters of Columbus and his expedition to find new territory. Isabella even sold some of her jewelry to raise funds for his fleet and she, according to Betham, sympathized with his “bold spirit”. 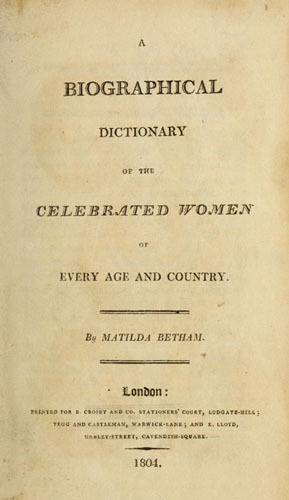 In 1821 Betham published Challenge to Women, Being an Intended Address from Ladies of Different Parts of the Kingdom, Collectively to Caroline, Queen of Great Britain and Ireland in support of Queen Caroline, who had been tried for adultery. Betham’s family committed her at least twice to an insane asylum. After one stay, she lived in London, keeping her address secret from her family. Later in life, when she had trouble supporting herself financially, George Dyer successfully petitioned the Royal Literary Fund for monetary assistance for her. Betham’s niece Matilda Betham-Edwards (1856–1919) wrote about Betham in Six Life Studies of Famous Women (1880). Possibly sharing Christina VII’s love of independence, Betham died in 1852 without a husband or children. The Smithsonian Libraries’ copy of A Biographical Dictionary of the Celebrated Women of Every Age and Country comes from the collection of Sarah Cooper Hewitt, who was a remarkable woman in her own right. Along with her sister Eleanor, Sarah founded the Cooper Hewitt Smithsonian Design Museum. Perhaps inspired a bit by Betham and the great women she described? Next Post Apply now for Summer 2017 internships!